Image: mariyapadalec85/Shutterstock, Praew stock/Shutterstock. Design: Kenzie Mastroe/SheKnows. It seemed as though it would never happen, but the snow is finally melting, the daffodils are starting to bloom, and you’ve stocked up on all the eggs you could possibly need for Easter. But now you’re left wondering how to decorate your Easter eggs this year. You don’t want any old basic, store-bought dye kits; you want your eggs to stand out. These cute, creative, and sometimes even plain weird designs will have you so excited to start decorating, you’ll need to head to the store to get even more eggs to act as a canvas. This year’s Easter egg hunt is about to get lit. If we didn’t know any better, we’d swear these Easter eggs were really cacti! These eggs go way back for inspiration, celebrating the Pagan roots of Easter with special symbols and sigils. Royal blue in color, these eggs sport gold and silver scroll work, shimmery ribbons, and are dotted with elegant beads that also kind of look like glamorous eyeballs in a cool way. These red eggs painted with bright, delicate flowers are so pretty, we can’t imagine ever cracking them. We like our eggs with a little attitude, and these emoji art pieces definitely fit the bill. These cute little swimming-capped eggs will put a smile on the face of any Easter egg hunter. It’ll be hard to put these Easter eggs in the fridge – they’re so adorable, you’ll want to play with them! Image: Public Lives Secret Recipes. Glam unicorns are always welcome at our Easter table, even when they’re actually just whimsically decorated eggs. Image: Dream a Little Bigger. You’ll use plastic Easter eggs to create these mini galaxy masterpieces, so you can use them year after year. Have you ever seen anything so luxe? These eggs are covered in real gold leaf, giving them extra shine and sparkle. A coat of mood paint is all you need to whip up a batch of color-changing eggs. Image: The House That Lars Built. 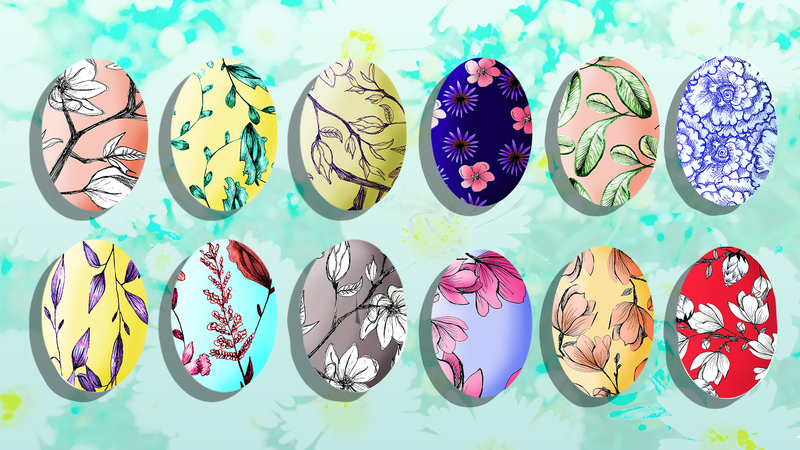 These beautiful botanical Easter eggs look like they belong on the walls of a museum, but they’re surprisingly easy to recreate. Raise some eyebrows at your family’s Easter gathering with some provocative collaged eggs. Pineapple goes on the Easter ham, and it also makes for perfect inspiration when you’re decorating your next batch of eggs.